The 2019 California State Legislative & HR Conference is the premier employment law and legislative advocacy conference in California. Almost 600 HR and business professionals from across the world doing business in California, attend this unique conference in Sacramento. 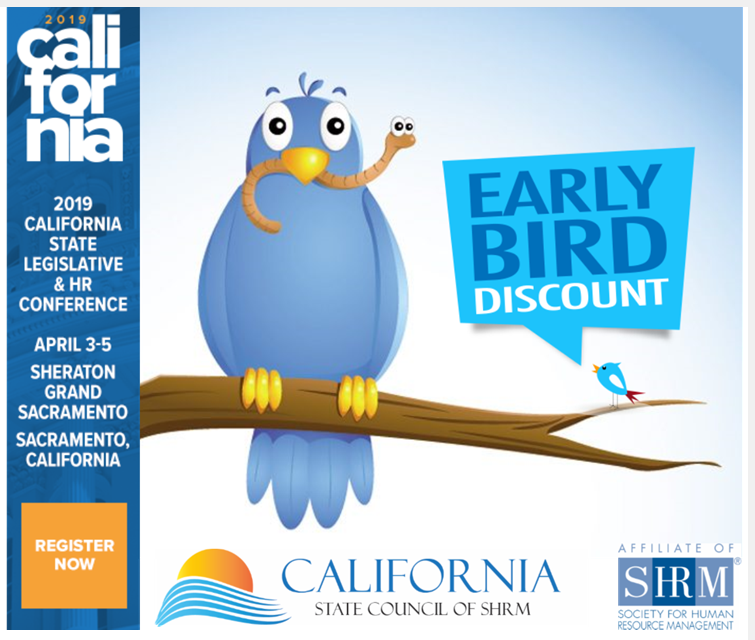 Our unique content attracts senior level human resource professional s - including CHRO’s, EVP’s, VP’s, and more – to California’s only HR conference dedicated to California Employment Law and Legislative Advocacy. Over 15 hours of learning sessions to help attendees with navigating and mitigating the complex legal, legislative and judicial landscape. Participate in the Advocacy Track to meet with your legislative representatives and staffs, and help shape future public policies and amplify HR’s voice at the state capitol. Opportunities to connect and network with exhibitors and other attendees. We hope that you can join us in 2019. Our attendee's legislative advocacy efforts have helped shape and influence employment legislation in the last seven years, and we need your voice to deliver the HR perspective to Sacramento.